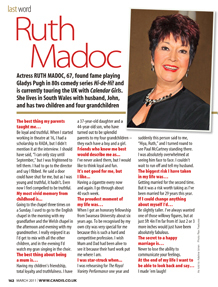 Actress Ruth Madoc, 67, found fame playing Gladys Pugh in 80s comedy series Hi-de-Hi! and is currently touring the UK with Calendar Girls. She lives in South Wales with husband, John, and has two children and four grandchildren. Be loyal and truthful. When I started working in theatre at 16, I had a scholarship to RADA, but I didn’t mention it at the interview. I should have said, “I can only stay until September,” but I was frightened to tell them. I had to go to the director and say I fibbed. He said a door could have shut for me, but as I was young and truthful, it hadn’t. Even now I feel compelled to be truthful. Going to the chapel three times on a Sunday. I used to go to the English chapel in the morning with my grandfather and the Welsh chapel in the afternoon and evening with my grandmother. I really enjoyed it as I’d get to mix with all the other children, and in the evening I’d watch my gran singing in the choir. Having my children’s friendship, total loyalty and truthfulness. I have a 37-year-old daughter and a 44-year-old son, who have turned out to be splendid parents to my four grandchildren – they each have a boy and a girl. I’ve never asked them, but I would like to think loyal and fun. Having a cigarette every now and again. I go through about 40 each week. When I got an honorary fellowship from Swansea University about six years ago. To be recognised by my own city was very special for me because this is such a hard and competitive profession. I wish Mum and Dad had been alive to see it because their hard work put me where I am. Ann Widdecombe prefers to spend her time writing novels and walking. 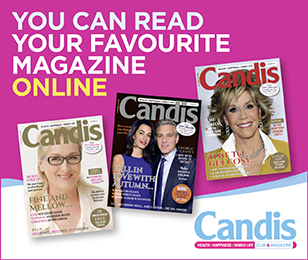 She has become one of the UK's leading diet and fitness experts.